When you are creating Visit Schedules, it's great to use a Naming Convention when describing them. freshOps uses the Visit Reference all over the WebApp, so a great Visit Name, will really help you move around and identify issues quickly. 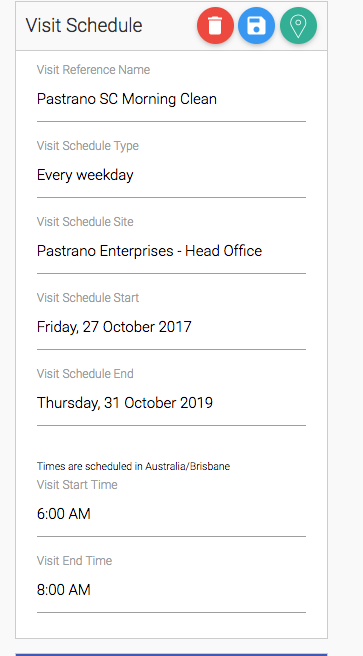 When you have Late Shifts, or Shifts Awaiting Approval, or Viewing Visits in the Visits Calendar we always reference the Visit Name. 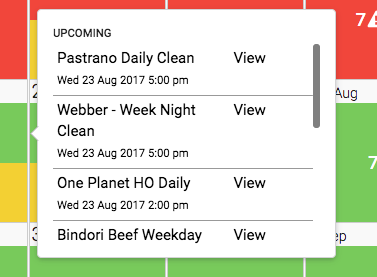 So if you call every visit name across all your sites for example "Daily Clean", you'll just see lot's of Daily Cleans and will have to Click on them to determine which Client,Site and Visit it is referring too, however, if you follow this guide, it'll make much more sense. These examples should help understand this better. Example 1: Fresh Building Supplies get's serviced each morning during the week. Example 3: Fresh Building Supplies get's 2 services a day during the week and 1 service on Saturday in the morning and 1 service on Sunday at Midday. You'll see above, by naming the Visits as we suggest I can easily see which Visit is being referred to. If we had not included the Site Name and the Frequency Details and named them all Daily Clean, this would be confusing. PLEASE NOTE: Any changes to the Visit Schedule Details will require you to Re-Allocate your Team to this visit schedule.